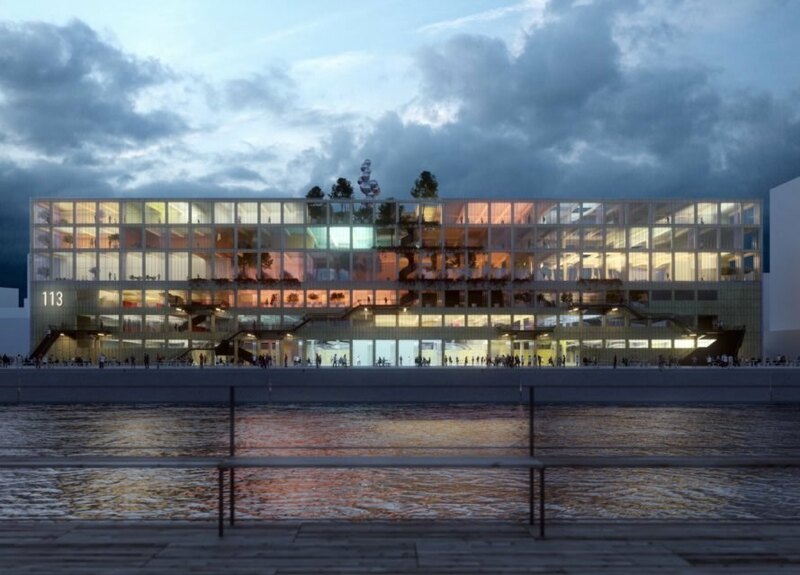 MVRDV and BSK Arkitekter have grand plans for Gothenburg, Sweden. 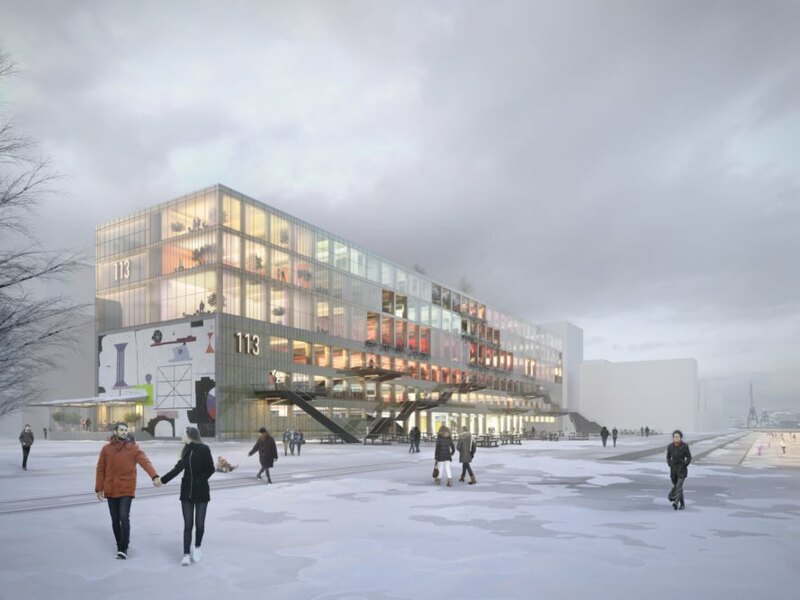 The two architecture firms just unveiled Magasin 113, a proposed transformation and extension of an existing waterfront warehouse in Gothenburg’s future Frihamnen RiverCity—the largest urban development project in Scandinavia. 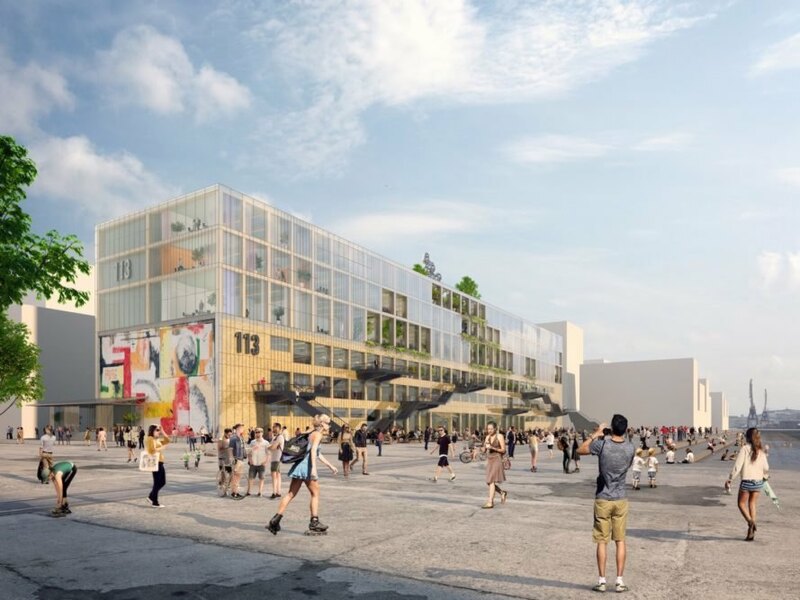 Once renovated and expanded, the multistory warehouse will offer 16,500 square meters of office space, an art center, pop-up spaces, a cafe, tourist information, retail, restaurants, and studios. Magazine 113 is one of the few remaining historic warehouses in the area. The mixed-use adaptive reuse project blends old and new, and will serve as a public hub for a livable neighborhood. The interior is organized into zones and connected via large freight elevators as well as a family of different types of stairs. An outdoor staircase on the waterfront-facing facade connects the different loading balconies with the main public plaza. 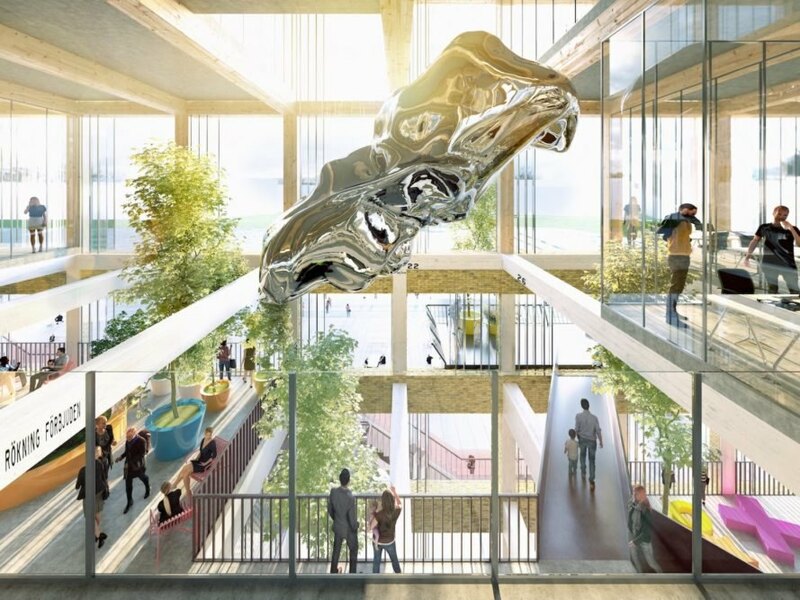 The architects plan to expand the concrete building’s footprint with the addition of three new levels of timber-framed floors above. A new public space will join the existing structure and new extension, visually uniting the two and attracting public activity from outside. The original brick facade and interiors will be restored, repaired, and displayed beneath a glazed facade to show off Magazine 113’s industrial heritage. 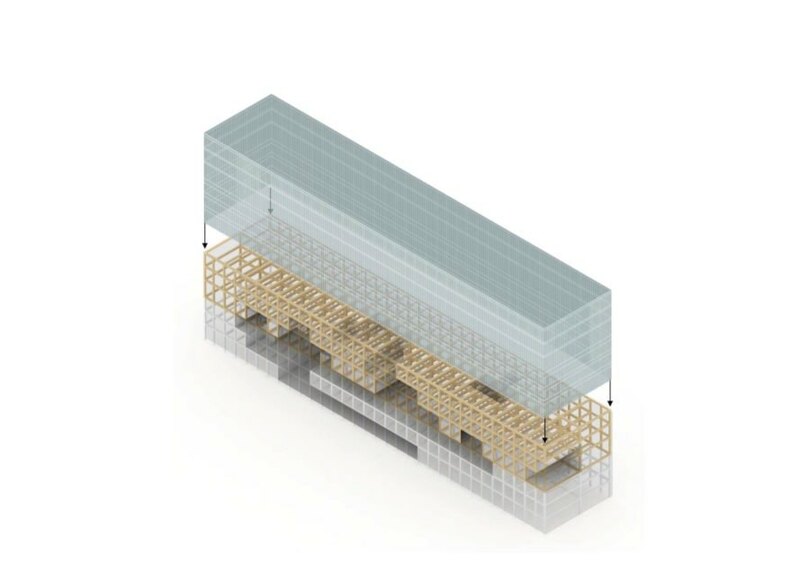 The glazed facade that wraps around the existing concrete warehouse and new timber-framed extension provides insulation and a protective “raincoat.” “This will add an exciting blend of a building that is ‘old’ and new, raw and smooth, and solid and transparent at the same time,” wrote MVRDV. Magazine 113 is one of the few remaining historic warehouses in the area. The mixed-use adaptive reuse project blends old and new, and will serve as a public hub for a livable neighborhood. The interior is organized into zones and connected via large freight elevators as well as a family of different types of stairs. The architects plan to expand the concrete building’s footprint with the addition of three new levels of timber-framed floors above. A new public space will join the existing structure and new extension, visually uniting the two and attracting public activity from outside. 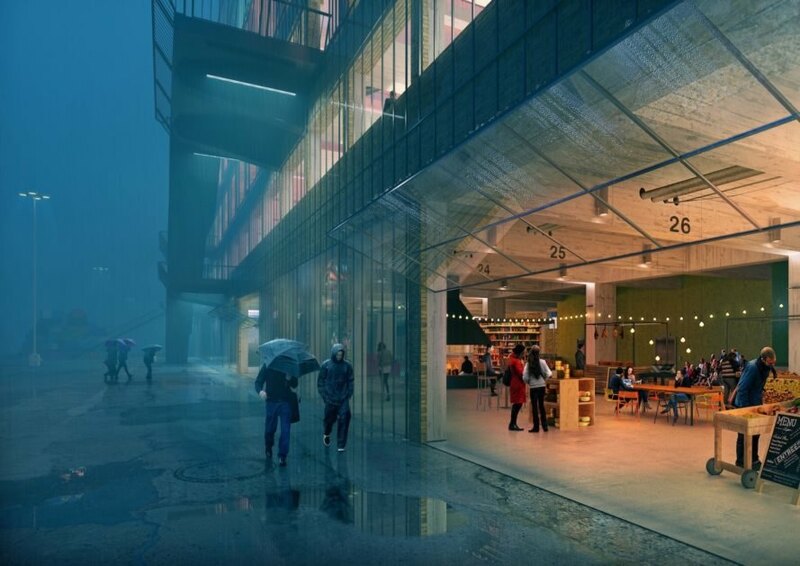 The original brick facade and interiors will be restored, repaired, and displayed beneath a glazed facade to show off Magazine 113’s industrial heritage.